Home/NUTRITIONAL SUPPLEMENTS/New products/Amino Free Peptides 400 gr. Amino Free Peptides from Extrifit is an excellent sport nutrition amino product that contains extra peptides. Peptides from L-Leucine , L-isoleucine , L-Valine , L-Glutamine & L-Arginine are necessary for muscle recovery , muscle synthesis & of course muscle growth. 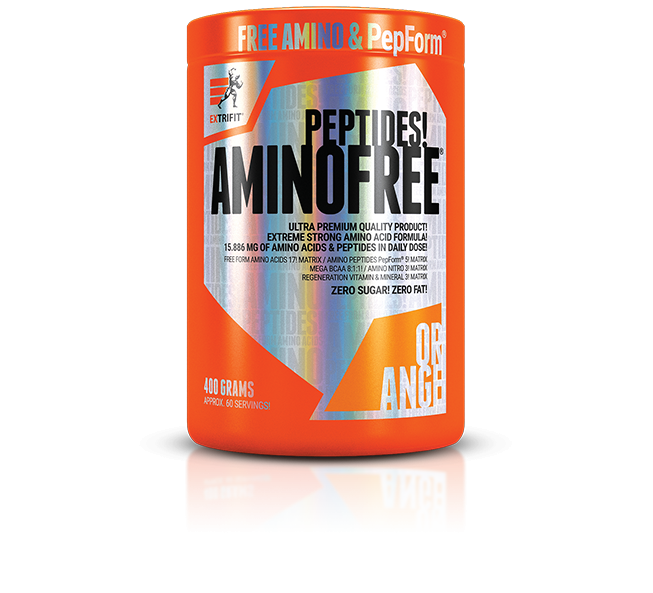 AMINO FREE PEPTIDES are ideal for athletes & sport people that want fast energy, great recovery. Also AMINO FREE PEPTIDES it is a critical product for those who follow low carbohydrate diet. We want always offer you products corresponding with the latest trend and the latest findings of sports nutrition science and AminoFree® is exactly such a product. It contains free form amino acids and patent pending peptides. This blend is enriched with vitamin B6 (pyridoxine) and minerals potassium and magnesium. Free form amino acids you certainly know. This product contains mixture of free amino acids including BCAA – the daily dose contains fully 5000 mg, glutamine - the daily dose contains fully 3000 mg, amino acids with specific effect, f.e. muscle pumping, as arginine and citrulline are, also beta alanine and other important amino acids. Depends on body weight, sports activity and diet. Possibility of usage: 1-3 scoops before your workout or after that. Mix 1-3 scoops with 100-300 ml of water.